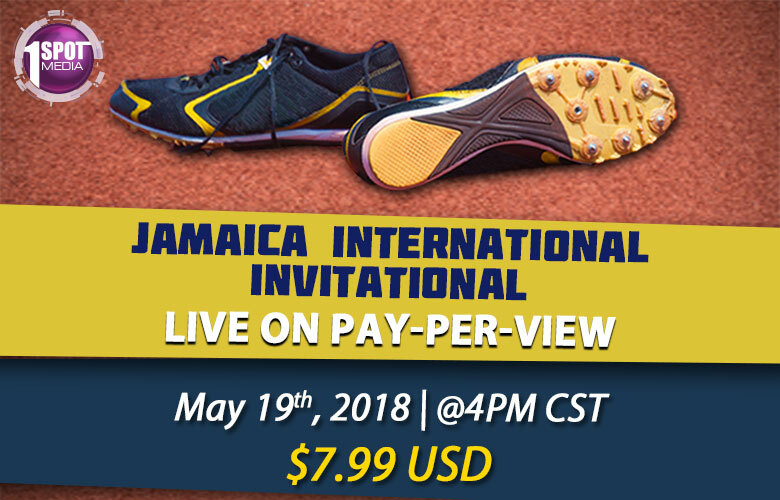 Login to 1spotmedia Pay-Per-View and watch some of the leading athletes compete LIVE, all at the Jamaica International Invitational Meet on Saturday May 19th, starting at 5:00pm CST. Purchase your pay-per-view pass now for only $7.99 USD to watch Jamaica’s very own – world junior 400m hurdling champion Jaheel Hyde, 400m World Championships medallist Shericka Jackson, double Olympic gold medallist Elaine Thompson, 100m sprinter Julian Forte along with international stars – Puerto Rican 400m hurdler Javier Culson, Nigerian sprinter Blessing Okagbare, American sprinter Mike Rogers and American 400m hurdler Kerron Clement. The Jamaica International Invitational is an annual track and field competition held at the National Stadium in Kingston, Jamaica as part of the IAAF World Challenge Meetings. Outside Jamaica, patrons of The Jamaica International Invitational Meet can register for the Pay-Per-View experience and access the live event anywhere at any time by downloading the 1spotmedia App from the Google Play Store or in the Apple App Store on any mobile device. They may also visit www.1spotmedia.com on a personal computer. Viewers in Jamaica can watch the event free “on the go” via TVJ and TVJSN on www.1spotmedia.com or on the 1spotmedia app. The 1spotmedia portal is the latest media platform from The RJRGLEANER Communications Group delivering thousands of hours of engaging video on demand content and live streaming of the Group’s four television brands TVJ, TVJSN, JNN and RETV as well as their five radio brands RJR 94FM, FAME 95FM, Hitz 92FM, Power 106FM and Music 99FM. « No Cases Of Yellow Fever In Jamaica!